Silence is more musical than any song. Hope is like a harebell trembling from its birth. I dream of you to wake; would that I might Dream of you and not wake but slumber on. 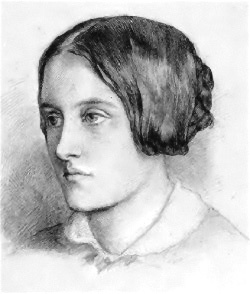 Christina Georgina Rossetti (5 December 1830 – 29 December 1894) was an English poet who wrote a variety of romantic, devotional, and children's poems. She is famous for writing "Goblin Market" and "Remember". She also wrote the words of two Christmas carols well known in the British Isles: "In the Bleak Midwinter", later set to music by Gustav Holst and by Harold Darke, and "Love Came Down at Christmas", also set by Harold Darke and other composers.